The Main Plenary II took place this morning. Keynote speakers Leah H. Jamieson of Purdue University, and Jack Lohmann of Georgia Institute of Technology, presented the recommendations of more than 100 ASEE volunteers, which build upon and respond to the many national and international reports on the future of engineering and engineering education, including ASEE’s Year of Dialogue. Past President Jim Melsa opened the session with some background on the project – how we got to where we are today. After a brief overview of the project by Jack and Leah, the audience was invited to dialog on the project responding to three questions on next steps. This portion of the session was moderated by President Sarah Rajala assisted by seven project volunteers who roamed the convention floor listening to the discussions and selecting individuals to present their thoughts to the other attendees all captured on big screen television in real time. Incoming President J.P. Mohsen closed the session challenging the audience to continue the conversation and provide their comments to ASEE via a website that will soon be operational and make this a Year of Excitement about engineering and technology education. The ASEE K-12 Pavilion, presented by Autodesk at the Exhibit Hall, was a new and popular feature this year. 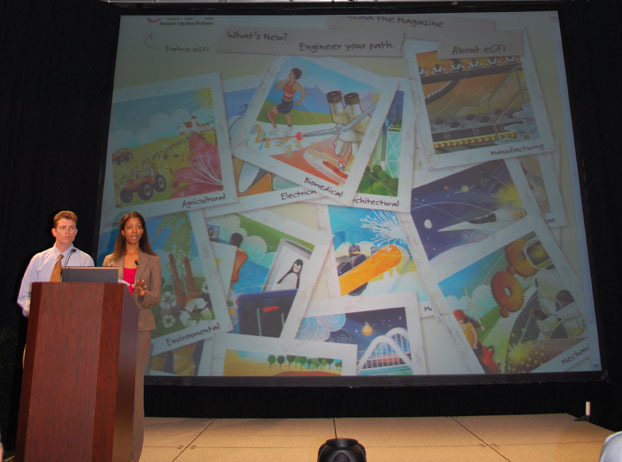 It showcased the work of ASEE corporate partners in attracting and retaining the next generation of students, and unveiled the new initiatives of ASEE’s K-12 Engineering: Go For It platform. 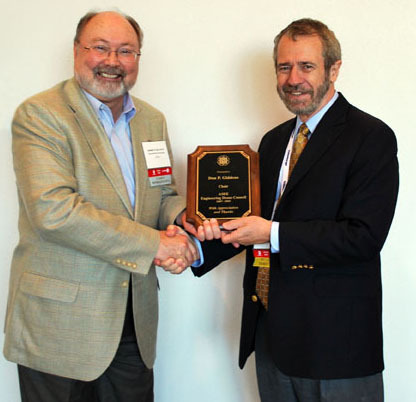 Also today, EDC outgoing chairman Don Giddens, Dean of Georgia Tech, received a plaque for his contribution and leadership to the Engineering Deans Council from incoming chairman Ken Galloway, Dean of Vanderbilt. 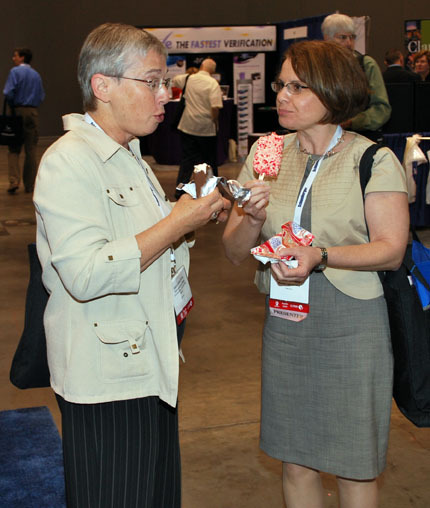 The “Focus on Exhibits” Ice Cream Social provided a refreshing afternoon treat for conference participants. Get ready for Wednesday’s distinguished lectures by stopping into the Exhibit Hall for a complimentary brunch 8:30-10:15. While there, take in the variety of engaging poster sessions, then move on to the many technical sessions. In the afternoon, don’t miss the ASEE Open golf tournament. The day’s events will be capped by ASEE’s Annual Awards Reception and Banquet. 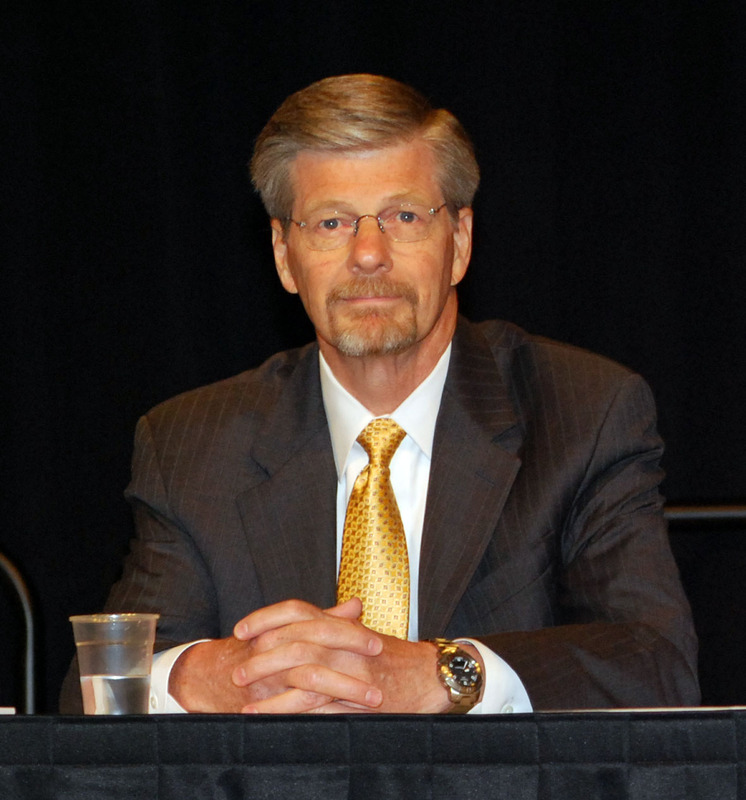 10:30 a.m. – Noon, Austin Convention Center, Ballrooms B, C, E, F, G.
ASEE is pleased to offer an impressive number of top education and industry leaders delivering the distinguished lectures this year. Please join us to attend: “Engineering the Future Engineer: A Sustainable Stimulus Package,” James Truchard, president and CEO, National Instruments; “Educating Engineers for Global Innovation: Is Problem-based and Project-based Learning a Strategy?” Anette Kolmos; “The Sky Is No Limit: Observations and Lessons from a Teacher in Space,” Barbara Morgan; “How ‘Her Story’ in History Has and Will Influence Women in Engineering,” Jill Tietjen; “Things I Have Learned, In Spite of Myself,” James Stice; and “Jane Marcet: Inventing the Technical Textbook Two Centuries Ago,” John Lienhard. Alternative-energy Laboratory Experiences 7:00 – 8:15 a.m. Austin Convention Center, 16A; Moderator: Sarma Pisupati, Pennsylvania State University. Papers in this session offer original approaches to energy conversion in a variety of settings. Recruitment and Development of Minority Faculty 7:00 – 8:15 a.m. Austin Convention Center, 19B. Moderators: Legand Burge, Tuskegee University; Bevlee Watford, Virginia Tech. Topics include mentoring, promotion, and tenure. 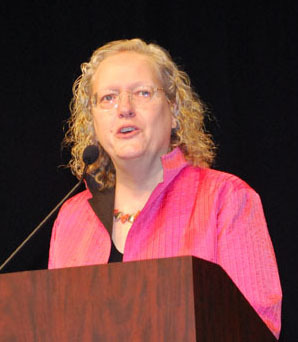 Advanced Materials Education 12:30 – 2:00 p.m. Austin Convention Center, 12B; Moderators: Aura Gimm, Duke University; Phillip Sanger, Western Carolina University. 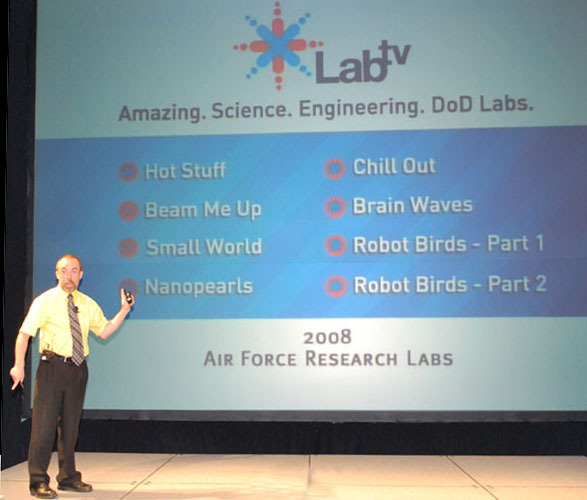 Papers describe recent attempts at educating engineering undergraduates in new material technologies. Women in K-12 Engineering 2:15 – 4:00 p.m. Austin Convention Center, 15. Moderator: Richard Gilbert, University of South Florida. This session explores issues related to enhancing, engaging, recruiting, and retaining women in engineering. Case Studies and Engineering Education Around the Globe 4:30-6:00 p.m. Austin Convention Center, 10B. Moderators: Michael Dyrenfurth, Purdue University; Kevin Kelly, Dublin Institute of Technology; Elizabeth Tront, Virginia Tech. Speakers from Ireland, Ukraine, Illinois, and Florida discuss the varying national, regional, and local factors that influence the preparation of university students. Design for Society and the Environment 7:00 – 8:15 a.m. Austin Convention Center, 8A; Collaboration, a Cool Tool: Librarians/Faculty/Students Work Together for Quality Results 12:30 – 2:00 p.m. Austin Convention Center, 17A; Distance and Web-based Learning in ET: Remote and Virtual Laboratories 12:30 – 2:00 p.m. Austin Convention Center, 18B; Laboratory Development in ECE Education 2:15 – 4:00 p.m. Austin Convention Center, 9B; New Trends in Graduate Engineering Education 4:30 – 6:00 p.m. Austin Convention Center, 8C. View sessions of interest for college and graduate students. Multidisciplinary Curriculum Innovation 12:30 – 2:00 p.m. Austin Convention Center, ML 6. 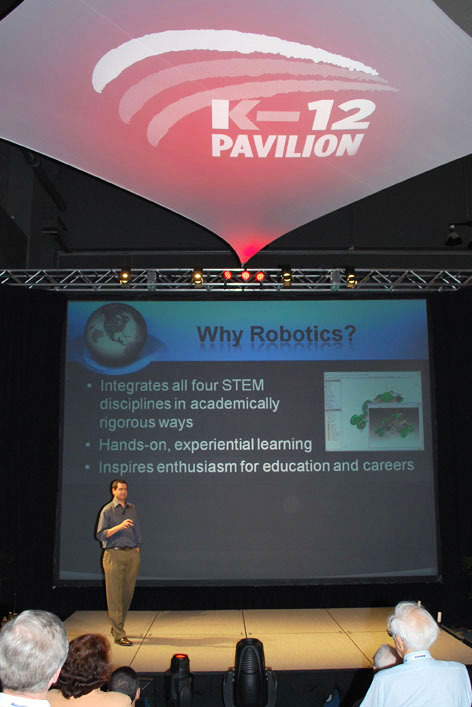 Engineering and Other Disciplines 2:15 – 4:00 p.m. Austin Convention Center, ML 6. Multidisciplinary Design in the Classroom 4:30-6:00 p.m. Austin Convention Center, 8A. 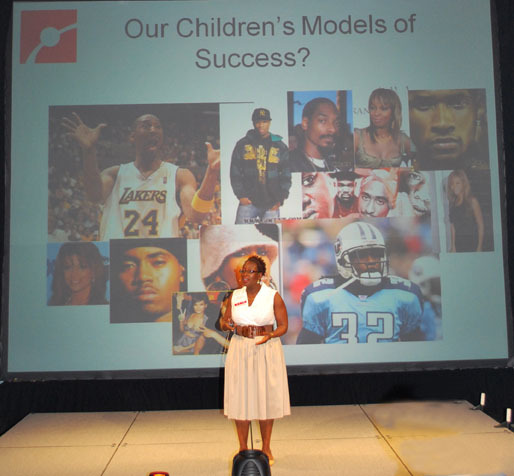 Educational Research and Methods 8:30 – 10:15 a.m. Austin Convention Center, Exhibit Hall 4. Division Poster Session 8. Explores freshman engineering students’ professional identity. WEPAN and WIED Joint Panel: Life after Tenure – Leadership Roles in Academia 8:30 – 10:15 a.m. Hilton Austin Hotel, Hilton – 406. Panelists discuss how faculty can position themselves and prepare to move into leadership roles. Power Breakfasts 7 – 8:15 a.m. Sponsored by the Academy of Fellows and by Zones I through IV. Ticketed Event: $10 advanced, $20 – 25 on-site. Check for locations, times and ticket prices at: www.asee.org/osl. 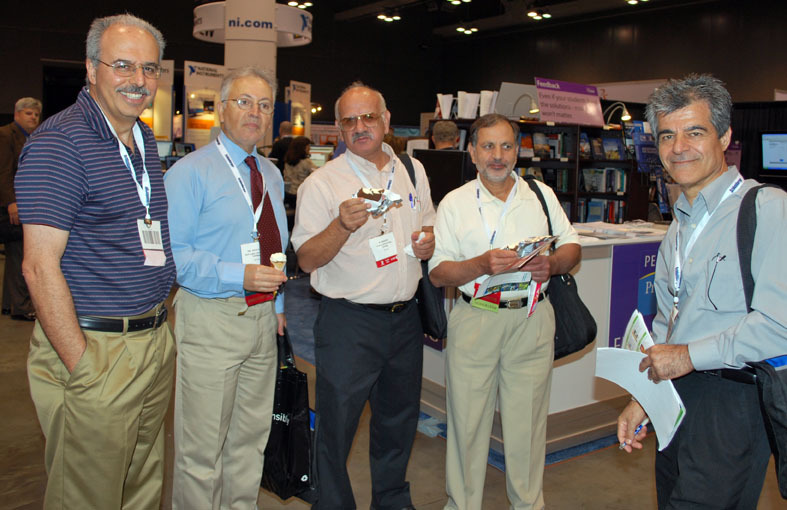 ASEE Focus on Exhibits Brunch 8:30 – 10:15 a.m. Austin Convention Center, Exhibit Hall 4. Complimentary. ASEE BISTRO 10:00 a.m – Noon. Convention Center, Exhibit Hall 4. Open during the Exhibit Hall’s hours of operation, the Bistro features breakfast, lunch, snacks, and beverages, available for purchase. ASEE Open Golf Tournament Noon – 8:00 p.m. Barton Creek Resort & Spa, Fazio Foothills Course, Austin, TX. Tickets: $90 pre-reg., $100 on-site. Club rental extra. ASEE Annual Awards Reception 6:30 – 7:00 p.m. Hilton Austin Hotel, Salon G. Complimentary for all conference attendees. ASEE Annual Awards Banquet 7:00 p.m. – 9:00 p.m. Hilton Austin Hotel, Salon H. Tickets: $75 advanced, $85 on-site. Registration continues Wednesday for attendees, exhibitors and presenters, 8:30 a.m. – 12 Noon in the Austin Convention Center Exhibit Hall 4. Please give yourself ample time before sessions begin. The Speaker Ready Room provides a dedicated quiet space for presenters to prepare their materials. 8:30 – 5:00 p.m. Monday – Wednesday, Austin Convention Center, ML-2. Internet not provided. This entry was posted on Tuesday, June 16th, 2009 at 10:15 pm	and is filed under Uncategorized. You can follow any responses to this entry through the RSS 2.0 feed. Both comments and pings are currently closed.